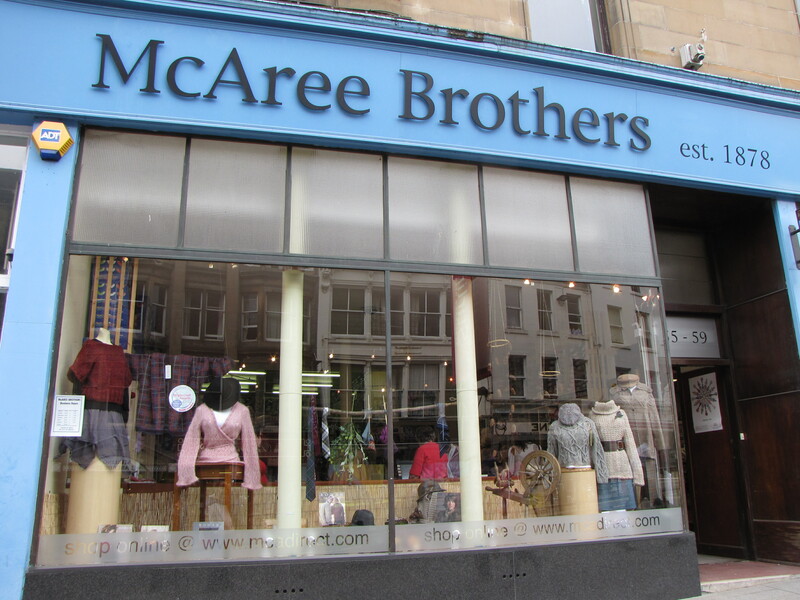 Stirling Yarn Shop: McAree Brothers | Knit Like You Mean It. It’s long past time for me to tell you about McAree Brothers. As regular readers of this irregular blog know, Mr. Trask and I spent three days in Stirling, Scotland, this August for UK Knit Camp. 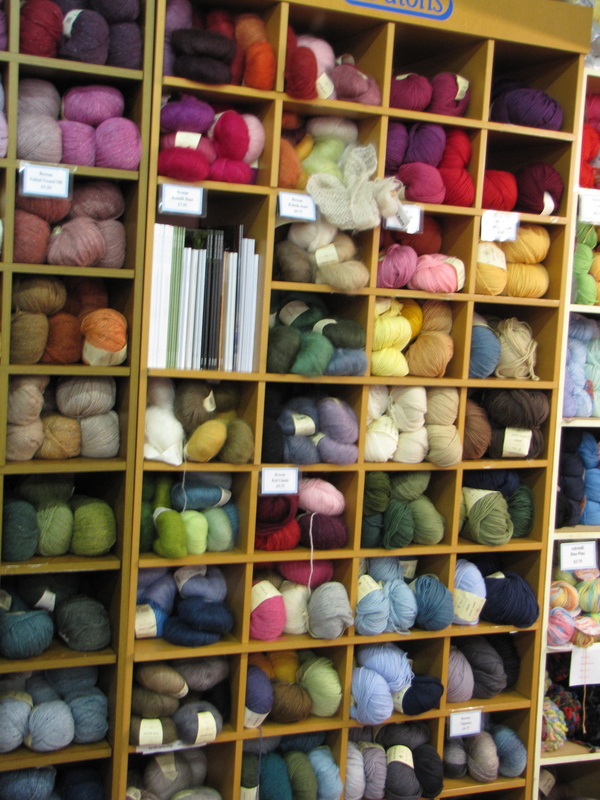 We stayed in town rather than on campus (even the patient Mr. Trask was wary of staying in a dormitory surrounded by knitters), and right around the corner from our hotel we found the promised land, or rather a lovely yarn shop. Yarn. Yarn, and More Yarn. I think this photo is blurry from my hands shaking with the excitement of it all. I don’t know if you’ve ever had this experience, dear reader, but occasionally I come across a yarn shop that isn’t, well, entirely friendly. And this was true for me in the very first yarn shop I ever set foot in, when I tried to buy yarn and book for a Rowan pattern, way back when I was a teenager (that’s another story for another time, but I had to be very stubborn indeed to be allowed to purchase same). Somehow, that has turned into an impression that shops that carry Rowan yarn aren’t the kindest around. Well, McAree Brothers proved that wrong. The knitting half of the shop was packed with Knit Camp attendees, and yet the women working in the shop made sure to greet each of us. I heard them help many folks who were trying to find very specific materials for their classes, with great patience and enthusiasm. 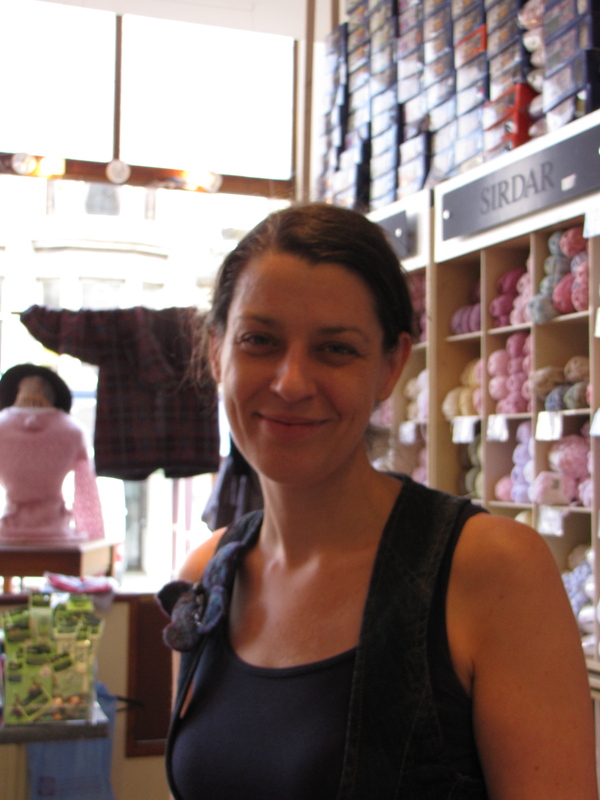 The Divine Carol Meldrum...who introduced me to Sublime Organic Merino Wool DK. My life will never be the same. One of the most exciting things about going to McAree Brothers was meeting knitting designer Carol Meldrum, who works at McAree and is as nice as cam be — funny, too. But what would you expect from the woman who brought us a book called “Knitted Icons,” with patterns to knit your own versions of Mr. T, Gandhi, and — yes — our own dear Queen Elizabeth II? 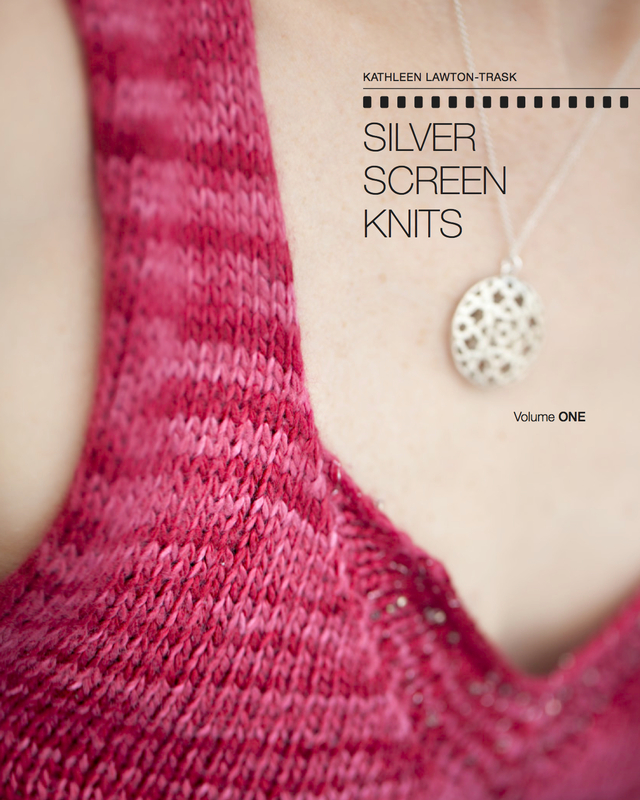 Check ’em out on Ravelry! Carol showed me all around the yarn shop, encouraged me to pet the Sublime Organic Merino DK (which, as faithful readers will recall, became the two-day adventure UK Travel Scarf and its brother Heathrow), and didn’t bat an eyelash when I came back an hour later for more. A fellow yarn addict, indeed! McAree carries most of the major European brands – Rowan, Sirdar (and its new line Sublime), Jaeger, Patons, and more. It’s well worth a trip to Stirling if you’re in Scotland. Heck, make a special trip just for some of that Sublime. It lives up to its name…and so does the sublime McAree Brothers.